On the 11th of November 2003 the Korean players Cho HunHyun and Lee ChangHo wrote a piece of Go history by creating a new opening pattern at as early as move 3. Up to that day the position after black 'A' in the diagram below had never been played before at professional level. 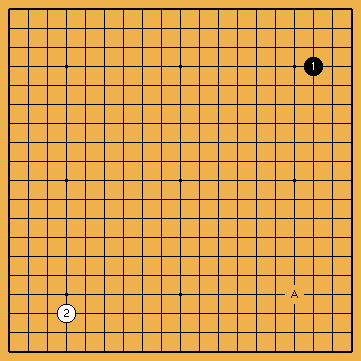 The likely reason why 'A' in the diagram has never been played before is that occupying the upper-left corner makes more sense considering the high positions of black 1 and white 2 towards that corner while these stones have a low (uninteresting) position towards the lower-right corner. Lee ChangHo decided to play 'A' anyway and went on to win the game. This is a fine example of the freedom of choice Go players have in deciding their opening moves. For corner developments (joseki) the past two months are being monitored. For whole board developments the past few weeks are being observed.